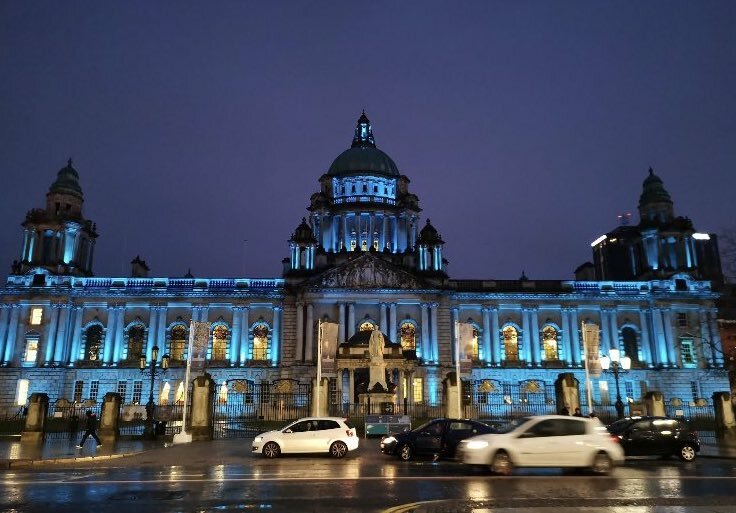 Belfast City Hall was lit up in the Teal of the Belfast Giants last night as the team turned out to a Civic Reception held in their honour. Days after lifting the Elite League title, Adam Keefe’s men were hosted by Lord Mayor Deidre Hargey in recognition of not only this years significant achievements but those of the organisation over the last nearly 20 years. Speaking at the reception the Lord Mayor congratulated the Giants organisation on their success in changing the landscape of sport in Northern Ireland. The Belfast Giants Ice Academy, an initiative that reaches out to underprivileged young people in society and uses the resources of the club and arena to help improve their confidence and social standing, was also recognised as the latest members of the Academy graduated. Alisha Duncan, once a member of the academy, now a mentor with the programme, took to twitter to tell her story and how the programme helped her confidence grow and watch as those around her experienced the same. Speaking with A View From The Bridge’s Simon Kitchen, Odyssey Trust CEO Robert Fitzpatrick expressed his great sense of pride at the achievements of the Academy. And in the light of the Trust’s ongoing determination to build additional ice facilities in the City he was delighted that the Lord Mayor brought up the proposal in her City Hall speech. The Giants look for their fourth trophy of the season as the Playoffs underway this weekend against the Coventry Blaze at the SSE Arena on Saturday night.